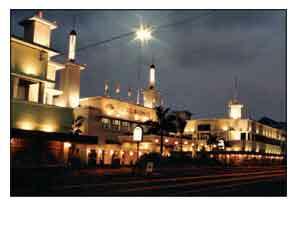 Mojopahit Hotel located at Tunjungan street (Central Surabaya), once it called LMS, Orange Hotel, Yamato hotel, Hoteru hotel and it became Europe and Nederland Center to give back authority Nederland in Surabaya. On 19th September 1945 there was a flag incident, that was the Surabaya troop tore the blue flag of the Nederland become white and red. The incident made the Nederland angry until one of them Mr. Pluegman died.